Berggasthaus Aescher-Wildkirchli. Photo by TC. APPENZELL: To see some traditional Switzerland visit the village of Appenzell. There you can get local cheese, sausages and handcrafted souvenirs. You can also do great hiking trips around the Ebenalp area. BASEL: The city where three countries meet. Stroll along the river Rhine and get inspired by the art museums. E.g the Foundation Beyeler is very famous for its high-class exhibitions and architecture by Renzo Piano, and the art museum Kunstmuseum got a new building with an impressive marble staircase inside by architects Christ & Gantenbein. BERN: The capital gets a page of its own! BLAUSEE: The "blue lake" is a little lake with small trails around it. You can eat fresh trouts from the trout farm in the hotel and also take the delicacies home. 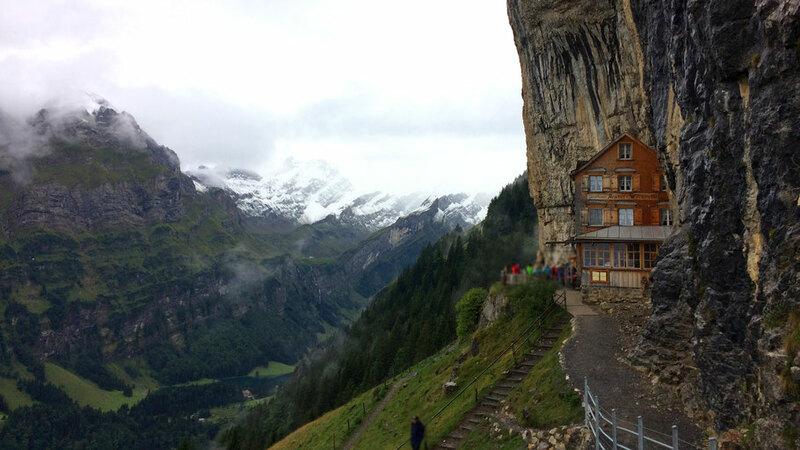 CREUX DU VAN: The Grand Canyon of Switzerland. You can hike up or drive to the restaurant Soliat by car. LAKE KLÖNTAL: Beautiful lake to take a walk around and have a swim in. LUGANO: Enjoy an Italian feeling in Lugano and relax at the lake while eating ice cream. For an affordable accommodation: Montarina Hotel & Hostel. You can book it here. MONTREUX RIVIERA: Montreux lies right at the Lake Geneva. You can stay at the luxurious Fairmont Palace (you can book it here), visit Chillon Castle or the famous Jazz Festival, which takes place in July. ST. GALLEN: Pretty city with the beautiful cathedral and library Stiftsbibliothek. Try an original St. Galler Bratwurst sausage. THERMAL BATH VALS: Baths designed by architect Peter Zumthor. You can spend a relaxing day in the spa facilities, stay in the hotel and stroll around the landscape. ZURICH: This city gets a page of its own!